The Control Group playing in the Biology grad Halloween party. In this guest post, Elvin E. Morales Pérez, Ph.D. Candidate in Biological Sciences, shares his favorite places to enjoy live music in South Bend. Hailing from a small agricultural town in Puerto Rico, finding entertaining music-related events that didn’t involve Salsa or Reggaeton was a bit of an issue. Don’t get me wrong, I enjoy getting my dance on every so often, but musical variety is an important part of a growing young man’s education. Once I moved to South Bend, however, I was very pleasantly surprised. “The Bend,” as it is more commonly known to the “Youths,” is the biggest city I have ever lived in (sad, I know) and as such, I wanted to explore everything it had to offer. It was during this process that I came to discover a very active, vibrant, and above all varied music scene in the city. 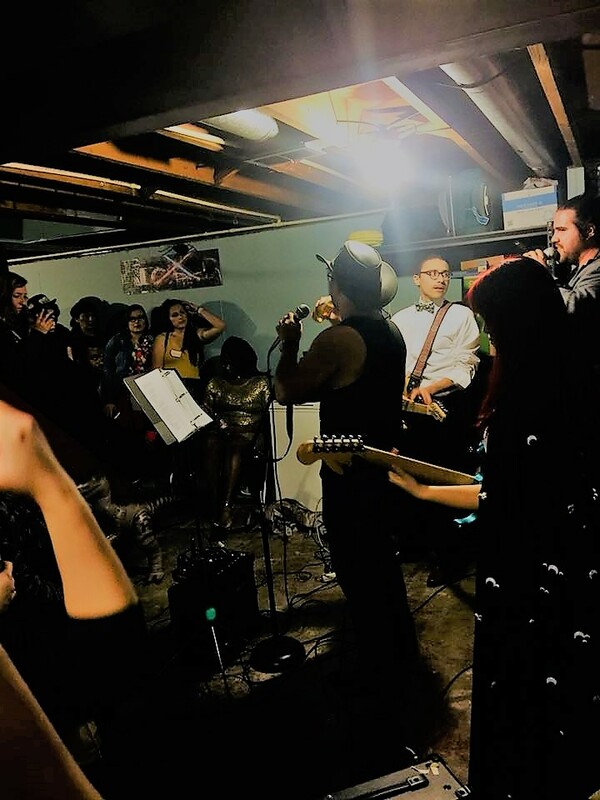 Live bands, open mics, dance events, random/slightly obscure/underground house shows (like that time my band The Control Group, played an acoustic show in my garage—shameless plug), and even cool roaming DJs spinning vintage vinyl from the back of a VW van (actual thing, not kidding), South Bend is just full of various things that anyone from professional or aspiring musicians to even regular music lovers would enjoy. Fiddler’s Hearth: South Bend’s very own local Irish pub is one of the most important musical focal points in the city with live musical events sometimes every day of the week. There is Open Irish Music Session on Mondays, Old Timey Music Sessions on Tuesdays, Acoustic Open Stage on Wednesdays, where you can play or enjoy shows by local bands playing anything from Irish folk songs to sweet, sweet funk music during the weekends. Fiddler’s is definitely a place where you’ll have a good time with some good food. Vegetable Buddies: Veggie buddies is a place full of South Bend musical history. A musical hub in the city during the late 70’s, this prominent musical venue — which hosted some of the greats in jazz, blues, bluegrass, and Woodstock-era rock and roll — returned to South Bend in the last few years and has kept that tradition going strong. On Fridays and Saturdays, Veggie Buddies hosts artists from all over, which sometimes even open the stage for local musicians to play with them, so if you’re interested in some cool music with some good atmosphere check it out. (They also have Latin Dance Nights on Wednesdays if you want to get your groove on; variety man, wonderful stuff). LaSalle Kitchen and Tavern: Although a little bit difficult to get to, involving a trek through the alleyway next to the building, and going up the back stairwell to the third floor (makes you feel kind of cool actually), the LaSalle Kitchen and Tavern is one of my favorite places in South Bend. Good food, good atmosphere, and above all, really cool music shows, with bands and solo artists playing most Fridays and Saturdays. One time, I heard a Spanish rock band playing which ended up hitting right in the feels, mainly because I was one of the few that actually understood the language that night, but it was still amazing. Lang Lab: When you first look at Lang Lab from the outside you may think “this place looks like an old warehouse.” Well, the reason why this is the first thing that pops into people’s minds is that it is a warehouse, or much rather, it used to be. The owners converted the 33,000 sq. ft. building into a multi-use cultural and educational facility that hosts several local businesses (one of them a coffee shop, yay! ), as well as many theater groups and musical artists. Additionally, it has its very own gallery, displaying pieces from various local artists. Aside from the various places I mentioned, there are also a lot of city-wide musical events like the Riverlights Music Festival, a two-day event which takes place every summer and includes over 50 local musicians playing only original music. Remember, these are only a couple of suggestions to get you going, there are still many places and events around “The Bend” that space constraints and a lack of literary wit prevent me from telling you about. Go out, explore, and start making fun, new experiences involving awesome, weird, and funky fresh sounds. Do you have any questions about living in South Bend? Ask the Salmon! Submit your questions to gradlife@nd.edu or go to the Ask a Question tab at the top of this page. Plays are a powerful mode of story-telling. Nowadays, our usual experience of narrative is through the medium of a screen, whether streaming a television show or enjoying a movie. Plays engage us in ways that are similar to film, but also in ways that are significantly different. No two performances of a play are the same. The varying emotions, energy, and character of actor and audience lend every performance a dynamism, particularity, and tangibility that often elude film. Don’t settle for reading Shakespeare in English class! You must see a play of his performed to understand his appeal and his brilliance. Of course a Notre Dame student’s go-to place for theatrical drama is the DeBartolo Performing Arts Center. At the end of every summer, the DPAC hosts the Notre Dame Shakespeare Festival. This year’s Festival included a community company’s performance of various scenes from Shakespeare’s plays, the performance by the Notre Dame Touring Company of Twelfth Night in locations around Michiana, and the centerpiece performance of Much Ado About Nothing by the 2017 Professional Company. Each year, DPAC also hosts Actors from the London Stage, a program that brings professional British actors to perform Shakespeare on stages across the United States. This year’s Shakespeare Festival may be over, but there is plenty more drama in store at the DPAC. ND Theatre puts on several productions each year by the Department of Film, Television, and Theatre and the Browning Cinema broadcasts National Theatre Live performances from the National Theatre in London. Check out the DPAC website for the latest schedule. Make sure that you sign in with your student account to access discounted student tickets! Located in the heart of downtown South Bend, the Morris serves as a venue for all manner of theatrical and musical events, including several touring productions of major Broadway shows. This year’s season includes Motown, A Chorus Line, and The Phantom of the Opera. Tickets can be somewhat pricey, especially since the Morris does not currently offer discounted student tickets. Still, shows like these are prime candidates for utilizing Grad Life’s GO Grants program, which can help to defray the costs of social outings for groups of Notre Dame graduate students and post-docs. The other main local option for drama is the South Bend Civic Theatre, a community theatre company that puts on a number of plays each year and runs educational programs for children and adults. You can attend shows, participate in classes, or even audition for your own role in an upcoming play! Regular tickets are $20-22 each, but student rush tickets are available for $10 on the day of each performance. Attending or participating is a great way of getting involved in the South Bend community. Finally, if you are willing to make the drive, Chicago Shakespeare Theatre offers $20 tickets to all patrons under the age of 35. They regularly put on professionally-produced works by Shakespeare and other playwrights in three different venues on Navy Pier in downtown Chicago. Of course, there are many more opportunities to get in on the drama in Chicago! Check out the performances taking place through The Chicago Theatre, The Lookingglass Theatre, The Steppenwolf Theatre Company, Broadway In Chicago, and many more. One of the best things about being within reach of Chicago is having ready access to the highest level of classical musical talent in the nation. Back in 2008, the Chicago Symphony Orchestra was deemed the best in the nation, and today it remains one of the premier American orchestras. In addition, the Chicago Lyric Opera regularly puts on some of the best productions in the country, including the talents of internationally-acclaimed singers from around the world. Tickets for the Symphony are regularly priced in excess of $100 and tickets to the Lyric can cost as much as $300 or more. Fortunately for you, both venues offer student tickets at a spectacular price. The Chicago Symphony Orchestra sells students tickets for select shows at $15 apiece, and offers the option of purchasing multiple tickets for a show. In addition, if you purchase tickets as a student for any concert on the day of the concert, you will pay 50% of their normal price. Season subscriptions are also available to students for 50% off or more. In order to prove that you are a student, you can either pre-register your ID with the Symphony Center online or bring your ID to pick up your tickets from the box office on the day of the show. Not a bad deal for some of the greatest music in history, performed by some of the best musicians in the nation. Individual tickets and subscriptions are on sale now. The Lyric Opera offers student tickets for $20 each to certain performances as well as a student subscription to three or more operas through their NEXT and NEXT Now programs. If you want tickets to an individual performance, you must subscribe (for free) to NEXT and, when tickets come available, you will receive a notification, at which point you can purchase your tickets. NEXT Now is the subscription option, and has some distinct advantages. You can still buy tickets for $20 apiece, but you must purchase them in advance for at least three performances. The advantage is that you can buy tickets for any performance and you don’t have to wait until dates come available. In either case, if you are fortunate, your tickets may be on the main floor of the opera house, where your neighbors will have paid five to fifteen times what you did! Individual student tickets and subscriptions are already on sale. If you have non-student friends, the Lyric also offers a membership program for young professionals (ages 21-45) that makes $35 tickets available to them. The opportunity to see vocal performers this talented for a price this low is not to be passed up lightly. If you enjoy musical events, first-rate cinema, dramatic performances, or superb voices, look no further than Notre Dame’s comfortable and elegant DeBartolo Performing Arts Center. Every semester, the Center hosts a variety of musical artists, both classical and contemporary, frequent showings of films, both time-honored and newfangled, powerful dramas from past decades and from the cutting edge, and scintillating organ recitals. Discounted student tickets are available to all performances, and the lower prices are good both for your own tickets and any additional tickets you may choose to purchase. Below, I have highlighted some of the many events from the 2017-2018 season. Although the annual Notre Dame Shakespeare Festival is over for now, there are still many other opportunities to partake of the performing arts throughout the coming school year. The Presenting Series comprises the main musical events of the season at the Performing Arts Center. A variety of talented artists, many of them internationally-acclaimed, will take the stage and, thanks to some generous funding, students can see them for far cheaper than would be possible at any other venue. Highlights include the Grammy-award-winning band Quetzal, talented baritone Nathan Gunn, Gospel singer Irma Thomas and the Blind Boys of Alabama, the Grand Rapids Ballet, former lead voice for Celtic Woman Chloë Agnew, and world-renowned violinist Itzhak Perlman. Make sure to log in with your student account to access discounted ticket prices. Make your purchase over the phone with the box office and they will sell you tickets for the astounding price of $6 apiece if you purchase them to three or more events at once. Compare this to the regular ticket prices at the DPAC (often up to $40) or elsewhere (often up to a few hundred dollars) to see the same performers, and you will begin to understand what a fantastic deal this is. $4 is the normal movie ticket price paid by Notre Dame students at the Browning Cinema. That would be news enough, but it gets better. This season, the Browning Cinema is also running a series of classic films that are free for students at Notre Dame, Holy Cross, and St. Mary’s, as well as a series of Sunday Family Films that are free for all children 12 and under. In addition to movies, the Browning Cinema also shows National Theatre Live broadcasts from the Royal National Theatre in London and Live at the Met broadcasts from the Metropolitan Opera in New York City (both are $16 for students). While these tickets are a bit more expensive than those for movies, they are still cheaper than what you would pay elsewhere. These broadcasts grant you access to the best artists and productions in the fields of drama and opera, all from the conveniently-located comfort of the Browning Cinema. For all Cinema events, concessions are also available: $1 for popcorn and $2 for a variety of candies. In addition to the Browning Cinema Sunday Family Films, free for children 12 and under, the DPAC also hosts a few other family-oriented events. Two of the Presenting Series events are intended for children and families, and the South Bend Symphony Orchestra will be performing the delightful Peter and the Wolf in March. In addition to all this, the South Bend Symphony Orchestra regularly performs at the DPAC, as well as professional and regional dance companies, and Actors from the London Stage, who will be performing a unique production of Shakespeare’s Measure for Measure in October. The DPAC also hosts professional organists, sacred music concerts, student music recitals, ND Theatre, and a variety of other artistic performances. Where else can you enjoy so many world-class performers and artists in one nearby space? Don’t miss out on the opportunity to see and hear the best of music, drama, and film, all on campus, and all without emptying your wallet. The perks of living in South Bend are many, and one is our proximity to the city of Chicago. One of the biggest cities in the United States, Chicago has something for everyone: museums, theaters, city parks, restaurants, and all manner of opportunity for adventure. If you are looking for food, music, or a just a stroll around the bustling downtown, the city is only a couple of hours away. The first step is to get to the city, a task not as easy as it may seem. The time it takes to travel to downtown Chicago by car from South Bend can vary from a low of 1 hour and 45 minutes to a high of 3 hours, depending on the time of day and the amount of traffic you encounter. If possible, you will want to avoid entering or leaving the city during the morning and afternoon rush hours, though you could hit traffic at just about any time of day. There are two major routes to Chicago from South Bend: the I-90/I-80 toll road and the I-94 interstate. Taking the toll road may save you some time, though probably not very much, and it will cost you a few dollars. Usually, taking the toll road is a better option for those who need to travel through the city to another destination. If you are driving to the city, you’ll also need to locate a place to park. Be prepared to pay at least a few dollars though, since free parking is non-existent in downtown and other tourist-heavy areas. While there are numerous parking lots and garages near to many of the main attractions, some can be quite expensive. The best way to find an affordable and conveniently located parking spot is to use an app or website ahead of time (SpotHero and Parkwhiz are two popular options), so that you know where you are going and what you’ll be paying to park. Once you have made it into the big city, getting around is not difficult. You can always drive in the city, though traffic and Chicago drivers can make things a little crazy. On the other hand, downtown Chicago is very walkable, and for locations in other neighborhoods, you can also take a bus or the metro. Check out current schedules, routes, and fares on the Chicago Transit Authority’s website. Various bike rental services are also available, including Divvy, the city’s official bike rental system. They have numerous docking stations throughout the city where you can rent a bike for 30 minutes at a time with your credit card, or you can buy a day pass online before you go. There is no end of things to do in Chicago, and any claim to an exhaustive list would be spurious. Below are a few suggestions for major attractions, but if you look around, you will be able to find just about anything you could want to do. Since tickets to these museums and to the Shedd’s Aquarium can be expensive, and since only the Field Museum offers student tickets, the most cost-efficient way to see multiple museums is to purchase a CityPASS (about $100 for adults), which gives you admission to five attractions in the city over the course of nine days, often with add-ons included. The pass includes admission to Shedd’s Aquarium, the Field Museum, the Chicago Skydeck, and your choice of either the Planetarium or the Art Institute and either 360 Chicago or the Museum of Science and Industry. Chicago, like every big city, has great food. Although the city is best known for deep-dish pizza (with Lou Malnati’s, Giordano’s, Pequod’s, and others all contending for the title of best) and hot dogs, you can find any other type of food imaginable if you are willing to look for it. For example, you might check out Cafe Ba-ba-reeba! for tapas or visit one of several Glazed & Infused locations for specialty donuts. If you are into coffeehouses, try Big Shoulders or The Wormhole. Pubs, cocktail lounges, and bars abound, as do restaurants serving Mexican, Korean, BBQ, Mexican-Korean BBQ, and foods that don’t belong to any category at all. With dozens of “best of” lists available from far more knowledgeable sources, providing yet another list here would be a futile exercise at best. Check out one of the numerous independent bookstores in the city, go to a Cubs or White Sox game, walk along the lake-shore, visit some of the city’s many neighborhoods, take an architecture tour, do a Big City Scavenger Hunt, or check out one of the city’s many bars and pubs, where you can hear the blues, watch some improv, or get a tropical tiki cocktail. In short, you’re not going to run out of things to do while visiting the big city of Chicago.